Description: Newly acquired unit in IHB's new livery light on the Kankakee Line south of Gibson Junction. Description: Westbound on the NS ex-NYc mainline near sunset at Pine Junction. Description: Eastbound IHB GP40-2 #4012 leads a mixed freight on the NS Mainline. Description: Here is another shot of Eastbound IHB #4012 GP40-2 in the 'New" paint scheme leading a mixed freight on the NS Mainline. Description: IHB 4012 brings it's train down the Harbor. Description: 4 types of IHB power: SW1500 1501, SW1200 2272, NW2 8834, & GP40-2 4012 SB over the Kankakee Line's Grand Calumet River bridge. Description: Leading an eastbound mixed freight on the NS mainline at Pine Junction. Description: Gibson shops, working on the brakewheel. Description: GP40-2s #4016 & 4012 lead a mixed freight along the Kankakee Line through the Mittal Steel area. The train is approcaching CP 502 where it will access the NS Chicago Line and head east. Title: a rare site the IHB Central Steel job waits paitently for clearance @ Elsdon. This job is usually a night job. Description: IHB GP40-2 4012 leads a westbound manifest through Dolton. Description: 3 SW1500s and a GP40-2. Beautiful paint, no obstructions, and the sun at my back. Does it get any better than this? Description: Just out of Michigan Ave. Yard and straddling the CSX ex-B&O mainline at Calumet Junction, this IHB mixed freight prepares to continue its journey southward on the Kankakee Line. 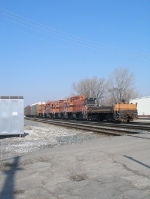 Description: Several IHB engines sit at Riverdale Yard. Description: Many IHB engines ranging from SW1500s to a SD38-2 sit at Blue Island yard.